"Vandal Hearts 2" takes the core of the strategy RPG gameplay from the original game but in a different direction to most games in the genre. Although featuring the same style of over-written & over-wrought storyline of typical JRPGs, a similar isometric perspective & interface, the key change to the turn system makes it a notable release in the genre. 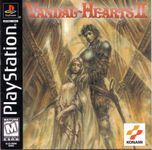 Instead of the usual turn based system or order system of its sequel & peers, Vandal Hearts 2 has a simultaneous movement system. The player queues up all orders/moves for a round, along with the AI. All moves are then executed simultaneously. This can cause considerable chaos with enemies moving away from where you expected them, movements blocked etc. It also leads to beautiful movements of tactical play when you predict the AI's movements for synchronised sequences of massive damage. Character development is principally done through equipped items - swords, shields etc. As characters fight battles with items, they earn XP & abilities associated with that class of item. As each item has a limited inventory slot (e.g. 4) for abilities, it's a delicate balancing act in which to take into battle. Vandal Hearts has an enhanced copy protection scheme aimed at detecting modchips on the PS1 & blocking playback on modified machines. This notably failed on NetYaroze machines (which are inherently region-free).